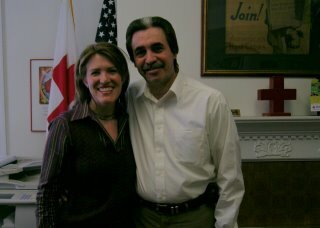 I had a final visit with my Disaster Action Team Director Ramone Jimenez, at the Red Cross headquarters in Fairfield. I was priviledged to serve with the Southern Fairfield County Red Cross chapter in the DAT teams. We responded to fires in our area and were able to be part of peoples lives at difficult times. I would recommend volunteering with the Red Cross to anyone! I've learned so much, including what logistics are and how to be a part of a team to accomplish a goal! It's amazing what the RedCross actually does, and it's not just Blood Collection, in fact it is mostly behind the scenes stuff! So I've had to "retire" from my team leader position and will definately miss it; although I don't think I'll miss hearing the phone ring at 3:30 AM to hear, "uh, Daganee, we have a fire..":-) Thanks Ramone, for the DAT experience and for all your sacrifice at the Fairfield chapter! Just one of the goodbyes that are happening and are sortof catching me by surprise.